You will need: stepladder, level, tape measure, Phillips head screwdriver and drywall anchor (if using premium hooks), hammer (if using standard hooks), pencil for marking. Remove curtain from the shipping box, discard plastic sleeve and place on a flat surface to allow for accurate measurements. Measure the width of the curtain and the distance between each grommet to indicate where the mounting hardware will be hung. On the wall, mark each grommet location with a pencil making sure it is at least two inches above the window opening. Install the hooks into the drywall or wood frame by first placing the hook where the grommet will interface with the wall and using a hammer or screwdriver to attach. All products come with standard mounting hooks that are tested up to 150lbs., however depending on the type of surface you’re mounting into such as drywall, concrete or brick please make sure your mounting hardware can support the weight of your curtain. If using our premium hooks, always use the drywall anchors which are included. To pre-drill the hole for the anchor use a ¼” drill bit. Once all hooks are secured to the wall, lift the curtain up and gently place each curtain grommet onto the aligning hook. After the curtain is hung, use a hammer to softly tap each hook closed at the top. This will increase the durability of your mounting hardware and prevent the curtain from slowly pulling the hooks open with continued use. Once the curtain or door panel is hung, peel off the backing of the Velcro perimeter seal so the adhesive side is exposed. Make sure curtain is entirely flat to prevent ripples in the center; this allows for maximum sound blocking protection. Note: The use of the Velcro perimeter seal is optional. Many customers find that the curtain hanging is sufficient enough to reduce sound transfer, however if your sound level is significant the seal will prevent sound from leaking around the edge. Apply firm pressure to the curtain edges, pressing them tightly against the wall and let sit for 30 seconds. This will ensure the adhesive end of the fastener is attached to the walls surface. Carefully detach the curtain or door from the Velcro perimeter seal and make sure the backing is attached to the walls surface. The first time detaching is the most likely to remove the Velcro from the wall so take your time. Your curtain is now fully installed! During shipping your curtain was in a confined space and with its continued use, your curtain will become more flexible and the inner core will break-in. It is normal to have a slightly stiff curtain during initial installation. Roll down curtain by lifting up on strap adjusters to allow the curtain to unroll itself. Once completely extended, press lightly against the Velcro perimeter so that there is a firm seal. Roll up the curtain by hand, starting at the bottom with a rolling motion. Cinch straps tight and tuck the excess straps into the curtain at the top. Keep packaging away from children. Do not put packaging or curtain over your head, as this may cause suffocation. Ensure curtain is secured properly to the wall. The type of fastening is dependent on the wall material and geometry. These curtains are purposefully heavy to block incoming noise, and therefore may require additional support. The drywall or anchoring material may be weaker than the supporting brackets or hooks – ensure that the wall or anchoring material is sufficiently strong to support the weight of the curtain. The packaged hooks are capable of carrying a load twice that of the curtain. However, faulty installation, or installing into a soft drywall with previous damage, may cause the curtain to fall. Do not hang curtain over fragile objects or small children, in the event the wall is too weak to support the curtain. By purchasing this product, you agree to read the installation manual and properly install and use the product to minimize the likelihood of damage or injury. Windows, doors, and other home interiors will vary in material and geometry, and no one-size fits all method will ensure that the curtain will be 100% effective. Use best practices to hang the curtains,. Do not allow fire or open flame near the curtain. The fabric is not FR-rated unless specifically requested. 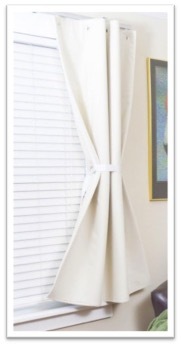 Ensure the curtain is snug and secure prior to allowing to hang free. Monitor for the first 24 hours to ensure there are no issues. Check back after 24 hours to inspect for any unexpected sagging or failures. All product defects are covered under our warranty. Do not use in a manner that is inconsistent with the product description. Do not hang over door that requires egress. Do not violate building codes that require egress in case of emergency. If you are unsure about egress requirements in your building, contact your building superintendent or engineer. You will need: stepladder, level, tape measure, flathead screwdriver, drill with 5/16″ drill bit, 1/4″ socket or a pair of pliers, pencil for marking. 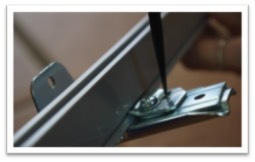 Take wall-mounting brackets out of package and start by attaching the first bracket at the end of the track.On each bracket you will find a top piece held with a single bracket screw that says ‘In’ and ‘Out’ on it, we will call this the In-Out tab. Loosen the bracket screw very slightly so that the In-Out tab can move with ease. Place bracket on the groove of the track about 1” from the end. Using a flathead screwdriver, use force to twist the In-Out tab under the groove until the word ‘Out’ is no longer visible. This will lock the bracket into place. Tighten the bracket screw to stabilize. Evenly space out the remaining brackets on your track with the corresponding end bracket about 1” from the end. 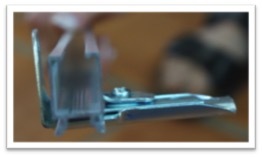 No bracket should be more than 24” apart or the track will deform over time. Once all brackets are attached, lift track and hold it on the wall at the desired location where it will be installed. Use level to confirm the evenness of the track prior to making any marks. While one person holds the track in the desired location, the second individual should mark the underside of each bracket with a pencil to show where it will be installed on the wall. Once marks are complete, take track down from it’s holding position and disengage the brackets from the track by turning the In-Out tab counter-clockwise until it is back in its open position. Align a bracket with each mark on the wall and use a pencil to mark the three screw holes. 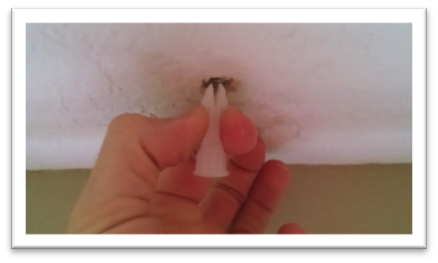 Using a ¼” drill bit, drill out each hole and insert drywall anchors with hands and/or light taps of your hammer, making sure they’re flush with the wall. Note: All walls have various thicknesses. For your convenience we have selected universal anchors, but please ensure your drywall anchors are sufficient for your specific installation. Once all anchors are inserted into the wall, align screw holes in the brackets to holes in the anchors. Screw in the screws. Note: The best practice for this step is to partially screw in all the screws at first before tightening them completely. This ensures that all screw holes and anchors are properly aligned. Now that all brackets are on the wall, have one person hold the track up to the brackets while the assistant latches the track and brackets together, one bracket at a time. This is done by twisting the In-Out tab with the screwdriver until the word ‘out’ is no longer visible. Once all In-Out tabs are locked onto track, achieve desired track placement by sliding the bracket insert towards the walls surface or away. Note: When adjusting the distance from the wall, you have two options. A small offset from the wall blocks more sound, but makes the curtain slightly more difficult to maneuver, while a larger offset has the op posite effect, blocking less sound but easily gliding along the track. Determine the distance that works best for your needs. This is very important, as it will prevent the curtain from becoming unstable after installation. Together, lift the curtain up and slide curtain gliders into track opening. Replace the missing end cap.If you purchased a split panel AcoustiTrac™, insert overlap carrier (the large plastic rectangle) to where it is hidden behind the curtain in the center. 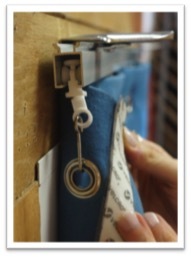 Once the curtain is completely hung, peel off the backing of the Velcro perimeter seal so the adhesive side is exposed. The curtain should be entirely flat when pressed against the wall to prevent ripples in the center and allow for maximum sound blocking. Note: The use of the Velcro is optional. Many customers find that the curtain hanging is sufficient enough to reduce sound transfer, however, if your sound level is significant, we strongly suggest using the Velcro to prevent sound from leaking around the edge. Press the curtain firmly to the wall and apply pressure to the top and sides to make sure the adhesive end of the fastener is attached to the walls surface. Let sit at least 30 seconds. Carefully detach the curtain and make sure the Velcro backing is attached to the walls surface. The first time detaching is the most likely to remove the Velcro from the wall so please take your time. Your curtain is now fully installed! During shipping your curtain was in a confined space and through continued use it will become more flexible and the curtain folds will break-in. It is normal to have a slightly stiff curtain during initial installation. To cover window, gently glide curtain to the right or left. Once completely extended, press lightly against the perimeter so there is a firm seal of the curtain to the wall. To expose window opening, glide curtain to one side and use the attached tieback in the center of the curtain to cinch it closed. You will need: stepladder, level, tape measure, 1/4″ wrench or socket, Phillips head screwdriver, drywall anchors (if anchoring into drywall), drill and 5/16″ drill bit and pencil for marking. Measure the width of the curtain and the distance between each grommet to in dicate where the mounting hardware will be hung. On ceiling, mark each grommet location with a pencil; making sure the curtain is centered over the window opening. Using your 5/16” drill bit, drill a pilot hole in the ceiling at each marked point. Take a plastic screw anchor and pinch the two ends together allowing it to easily feed through the pilot hole. When pressure is released the anchor will expand and grip t he backside of the drywall ceiling snugly. Continue process for all pilot holes, making sure each anchor is flush against the ceiling surface. You may need to push the anchor or widen the pilot hole slightly to do so. Twist the ceiling screw hook into the anchor until the thread is no longer visible. The bottom of the hook should be approximately 2” from the ceiling.Each anchor and hook is capable of holding more than 140 lbs. of force when properly installed. If you notice sagging or other deterioration of the hook, inspect and repeat the procedure above. Once all hooks are secured to the ceiling, lift up your AcousticCurtain™ and gently place each curtain grommet onto the aligning hook. 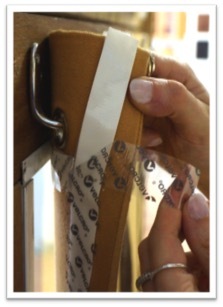 Once the curtain is hung, peel off the backing of the Velcro perimeter seal so the adhesive side is exposed. Make sure curtain is entirely flat to prevent ripples in the center and allow for maximum sound blocking. The use of the Velcro perimeter seal is optional. Many customers find that the curtain hanging is sufficient enough to reduce sound transfer, however if your sound level is significant the Velcro will prevent sound from leaking around the edge. Apply firm pressure to the curtain edges, pressing them against the wall tightly and let sit for 30 seconds. This will ensure the adhesive end of the fastener is attached to the walls surface. Carefully detach the curtain from the Velcro perimeter seal and make sure the backing is attached to the walls surface. The first time detaching is the most likely to remove the Velcro from the wall. Please take your time. Your curtain is now fully installed! During shipping your curtain was in a confined space and through continued use it will become more flexible and the folds of your curtain will break-in. It is normal to have a slightly stiff curtain during initial installation.